Scanning through my 'Facebook Feed', I suddenly realize that the lines between type 1 diabetes and non-type 1 diabetes have been blurred. No longer is there a distinction between friends that understand and those that do not. Maybe it was from the process of natural selection or maybe a bit of weeding occurred. I admit that early on, a few had to be plucked. Like the mom who voiced concern about all of the 'needles and blood in our home'. Um, good-bye. But then the happiest thing occurred with friends learning and embracing type 1 diabetes. One note from a friend (without children living with type 1 diabetes) tells me that the birthday treat from her son to be brought to school is a popsicle and each is 14 carbs. Swoon! Such a kind, kind, kind gesture from a mom who cares. Another feed announces a recap on the latest type 1 diabetes gadget. A couple of others come from my own blog but have friends without type 1 diabetes adding helpful hints. My friends have been following along and want to help, like they would with anything happening within our life. I think diabetes has been demystified and we have shown how normal all of this is. 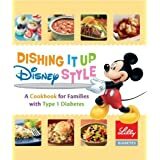 Two other friends that I can't imagine not knowing share a story (that has nothing to do with diabetes)about their families. While we met through diabetes, I am friends because I truly enjoy their company. Love this the most! The best part of diabetes has been connecting with so many wonderful people! And so it goes... with almost every post/feed/friendship connected back to type 1 diabetes. Remarkably after seven years, everyone is on the same page. Thank you for reading Naturally Sweet Sisters and be sure to send me your mailing information so I can send this to you right away! A lot of people ask me how I keep positive. Maybe it is the things I surround myself with. 'Things' like oldest and youngest daughter. We WILL get a CURE! In my last camp post, I gave you a list of what to pack for diabetes summer camp, or really, what to pack for children going away to any kind of adventure camp. In this post, I am going to detail one of my favorites ways of how to pack clothes for children while they are away from mom and dad. Seems sort of simple right? Like all you need to do is just neatly fold clothes, place gently in suitcase and zip tight? Which means that your child will probably stick with approximately one shirt and one pair of shorts for the entire week. Don't even dwell on the underwear because I can guarantee that will not be changed! And to think that much of the camp staff is on a volunteer basis! Ew! A few years ago, a veteran camp mom on an on-line website told me to start packing my child's camp things in Hefty or Ziploc storage baggies. The veteran camp mom said the 2.5 gallon size was the perfect size to hold exactly one day's worth of clothes. And she was right! Brilliant! After a rigorous test (two years' worth of camp mayhem), my daughters and I have arrived at the conclusion that this works perfectly! My oldest particularly loved this idea because no one had to see her ahem! 'unmentionables' as she traipsed out of her cabin each morning to shower. She simply woke up, found the right bag and headed off. Her friends without the bags often misplaced a sock or worse, found themselves in the shower stall without a clean shirt or pair of shorts. Oh no! The dreaded 'what do I do now when mom is not in the next room'???? Below, is the Naturally Sweet Sister's version of the Ziploc bag packing method. This has been modified to include a little extra sweetness. Not only do we pack clothes, we also pack LOVE. I can't help myself. I miss those girls while they are gone! For your viewing pleasure, I snapped a few pictures of what I do to prep the bags. First, I either use a Sharpie marker to label each bag or I type/print a list of the child's name and corresponding day of the week. I like the print method for ease of use as I am doing everything x2 and it gets a little tedious. Not to mention, that I have a bad case of sloppy handwriting when doing things in multiples. It makes it hard to read for beginning readers. Or so I have been told by youngest daughter. Once you have labeled your bags, here is where the sweet part comes in; create a once-a-day love note for your child. This will actually help to inspire a daily clothing change each morning. Your child will be eager to see what special letter or joke or funny comment that mom or dad has left for them. For this step, I use a large-size heart shaped punch. No, I didn't buy it for this project but I do use this a lot. It's a great investment. Punching out one heart for each bag that I assemble, takes only about 30 seconds. You could fold a piece of paper in half and use scissors to cut a heart shape as well. My notes are simple and encouraging. Just a few words from mom to start off the day. Place the heart into the Ziploc bag and then add your day's worth of clothes - like one pair undies, one pair socks, one bra, one t-shirt, one pair of shorts. Your child can take this little Ziploc bag bundle, along with a hanging toiletries bag right into the bathroom each morning. Dirty clothes can be placed back inside to make sure that all items are returned to the cabin or your child's laundry bag to take home. I think we managed to save a lot of sock lives this way! Over the course of time, our girls have always had what we like to call 'responsibilities'. The naturally sweet hubby and I realized that at an early age, even the smallest of kiddos could be assigned a task or have responsibility for something within our household. It didn't have to be a big task or a big responsibility either. 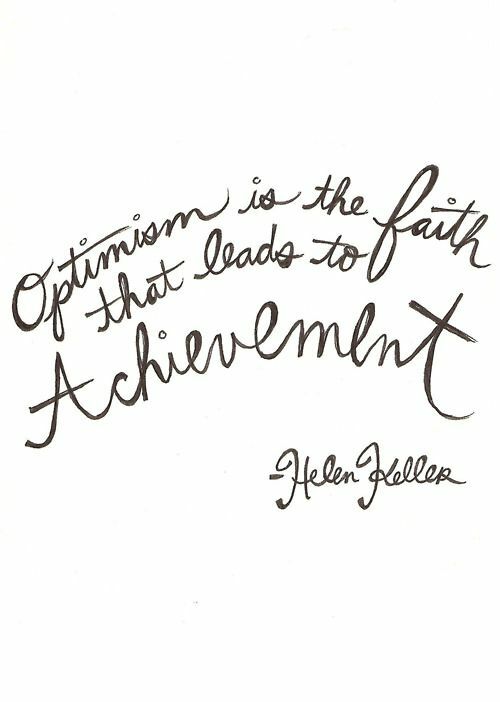 As long as it was accomplished correctly and with a good attitude (no shrugging or eye-rolls please! ), it was successful. Plus, I secretly had nightmares after hearing of friends who told me that they went to college without knowing how to operate a clothes dryer! Oh my! We started with having the girls start brushing their teeth, washing faces, combing their hair and writing thank you notes. As the girls grew, their desire to have a family pet helped us to add the next level of responsibilities, cleaning the litter box and adding fresh food and water to our kitten bowls. Last year we added extra things like making beds, picking up toys from around the house and helping with bigger projects - like cleaning debris up from the tree hitting the house or assisting with the laundry. We also upped the ante and added $1.00 allowance per day for each completed day's worth of tasks. If the kids forgot their responsibilities, mom and dad still had to do it, so instead of paying the children, we paid ourselves. Oh yes! That's right! We paid ourselves. Now, that is an eye-opener for children! A few neat things happened. * Our kids realized that they could buy things without mom and dad saying no. * They learned the value of saving up for bigger and better things. * Things that they purchased had more meaning and were taken better care of. * We never had the whining in store for something they wanted. All I had to say was, "Did you bring your own money?" They knew if they could afford it or if they felt it was worth the cost. Interestingly enough, it also taught our children about hard work and the realization that without working, they literally had empty pockets. The remedy? More completed responsibilities the next week. I am seriously hoping that this lesson stays with them through their teens and early 20's. Oh my! So one more really cool thing happened. By establishing responsibilities, even though our kids had been diagnosed with type 1 diabetes, we instilled the expectation that life would continue on, as normal as possible. We helped our children to clarify their own identity so that they knew they were regular little kids. Type 1 diabetes or not, our kids learned that their identity meant to be good citizens and they had the responsibility to take care of household chores, homework, our family kitten and even themselves. There was no forgiveness on high or low days... either you completed your responsibility or you didn't. Through doing all of this, we helped our little girls discover their own abilities - and removed the idea that they had any sort of disability. We also gave them a very stable home environment that clearly outlined the expectations and roles of each person in the family. Not to mention that it also left us a lot of time for loving and cuddling and snuggling - mom had less to do on her own! As we head into another summer and with two slightly older kids, I am modifying the responsibilities list by giving it a new name. I thought I might share it with you for a fun opportunity for everyone to teach their kids a cool way to earn allowance money. Inside the jar are about 30 different household chores. Each completed chore is worth $1.00. Every time a chore is completed and verified by mom and dad, the family worker gets to add the chore to their own bucket. All chores will be paid on Sunday. Now here is the catch: mom and dad have a bucket too. Any chore that they (we) complete first, goes into the 'Mom and Dad' bucket for the week and that chance to earn money for doing that chore during the week is done. Also, the chores are to be drawn out of the jar at random. Whatever you get, you have to do. If you choose not to do it or if you try to re-draw, you lose your chance for the day to do any other chores. You also lose the chance to earn any money that day, which is very disappointing. However, if you are on a chore roll, after every completed chore, you can redraw to get another chore - for as long as you would like and ultimately, earn as much money as you can. Just make it clear that mom and dad must verify to ensure the chore was properly completed before moving on to the next task. I placed the Chore Jar near their bedrooms in the hallway with the diabetes refrigerator. I thought it might be a nice daily visual of how many dollars they have coming each week. They can't walk by without seeing it! With oldest daughter yearning for more make-up and youngest daughter wishing for Bath and Body Works supplies, this will be a nice incentive to help them both, especially over a long summer. And me too. Less for mama to do by herself is always a good thing! What's that saying? If mama ain't happy, no one is happy?! Right now, I am very happy! As the week comes to an end, here are a few blog posts from bloggers that I haven't read before. I chose a sample from Day 4., Greatest Accomplishments to share with you. I hope you enjoy! 1.) Dog Goes To College - Adventures of a college student and her service dog. 2.) One Girl's Diabetic Life - Awife, foster mama, wannabe couponer, kindergarten aide, thrifty shopper, lover of all things organized, and a Type 1 diabetic. 3.) Life Beyond Glucose - Lately it seems like my entire life is about counting carbs, measuring food, and injecting insulin. I thought that maybe if I write it all down I can figure out what my life beyond glucose is. Tomorrow, a new post on who I am a fan of....... do you think he might send me a poster???? School is still in session with no time for extra art projects, so without further ado, here is our "Art" - our 2013 Naturally Sweet Sisters Walk to Cure Diabetes video. Just like in the movie, Freaky Friday, today we’re doing a swap. If you could switch chronic diseases, which one would you choose to deal with instead of diabetes? And while we’re considering other chronic conditions, do you think your participation in the DOC has affected how you treat friends and acquaintances with other medical conditions? The ironic part is that much of my needing to dispense that advice isn't about the ills of having type 1 diabetes. It is about kids with long, straight, shiny hair - when my daughter is bemoaning her curly locks. It is about kids with smart phones - when my daughter is feeling left out at not having the latest app or access to Twitter. It is about perfection and glass houses and every fable that we have ever read. But of course I am substituting real life analogies in the hopes of teaching my children that there is no one who is perfect. I think it would be a terrible mistake. At least we know the ins-outs of type 1 diabetes. The surprises are less and less. We understand the roller coaster, the Diabetes Monster, the serial killers, the mean endo nurses, the idea that the student does in fact become the teacher. As with curly hair and dumb phones, it is a part of who we are and to heal, we learn to ACCEPT TYPE 1 DIABETES. The kid with the smart phone? His mother is dying of cancer. The girl with perfectly straight hair? Her family is broken and she spends long hours alone. When the realization of those tragedies unfold, the myth of perfection is also shattered. We can not compare ourselves to others, no matter how tempting, because each of us quietly battles a (often unseen) monster of our own. I have asked my kids if they would trade it and they both asked what for... a puppy? YES! ....a million dollars? ABSOLUTELY! But for another chronic disease? .... um, no. I know where our world of type 1 diabetes is heading. Better treatment, better technology and even a CURE. I've taught that HOPE to my children as well. We are sticking with this until that day comes. Who knows, it might be sooner than we think! Diabetes Week Post 3 - Today we’re going to share our most memorable diabetes day. You can take this anywhere.... your or your loved one's diagnosis, a bad low, a bad high, a big success, any day that you’d like to share. I actually forgot about this story until last week, when I shared it with a newly diagnosed family. I think it defines the feelings that most of us have during those first few tedious days of learning how to care for our children. And it also exemplifies how nuts I was! In 2006, care was a little different for a newly diagnosed family than it is today. After being discharged from our week long stay, I was given the gift of receiving a visiting home nurse. Well the irony is that my visiting home nurse, a lovely woman that we shall call Rhonda, was not in the least bit experienced with type 1 diabetes (or even type 2 for that matter). What I didn't realize was that Rhonda's area of expertise was in teaching how to correctly draw and inject a syringe. That was it. She came to our home with the understanding that this newly diagnosed family needed help with injections. I didn't need that kind of help though. At four or more syringes a day, I was already an expert in pokes. What I didn't know what to do was how to feed a skinny three-year old toddler or even our family. Everything seemed wrong and I couldn't remember what were taught in the hospital. But one look at my ashen skin, worried frown lines and total lack of sleep, prompted her compassionate side to help us. Together, we decided the best route to take would be carb counting and meal planning. Remember, I had no idea of what I was doing. Now, our pantry is large and always well stocked. One look inside and she started clicking her tongue and shaking her head. "Everything inside the pantry has carbs", she said. "This won't do." So like two crazy people, we started dumping everything into a large garbage can. Cereal - no. Chips - no. Pancake mix -probably not. Cupcake mix - Oh ABSOLUTELY NOT! At the end, I was left with some cooking oil, some unpopped pop corn and a variety of seasonings. Then Rhonda and I sat down to start creating a list of things to buy. The words 'SUGAR-FREE' topped the list along with 'NO-CARBS'. We couldn't think of a lot except sugar free jello and sugar free crystal light. Still, Rhonda had me convinced that once I got into the grocery store and hit up the reduced sugar aisle, that I would find all sorts of good things to feed my child. Since I couldn't leave the house until I knew my daughter was sleeping (still paralyzed by the fear that something bad would happen the moment that I left), I stayed, waiting until after the 3:00 a.m. middle-of-the-night glucose check to furiously drive to our local 24-hour grocery store. Let me just tell you, the grocery store is a strange place at 3:00 a.m.. The aisles were being re-stocked by dudes that looked like they had never seen daylight. I also realized that most of the shoppers were getting munchies and had probably - no definitely! -closed down the local watering holes. And here I am in the midst of all them, loading up a cart full of diarrhea inducing sugar free products, all the while trying to stifle the avalanche of tears. An hour or so later, as I struggled to push my overly full shopping cart into the check-out lane, a guy with his bag of munchies turns and looks at me with huge eyes. "Whoa! What happened to you?" he said. I don't know why I told him this but I did. "A fire. We had a fire." As weird as that statement was, he just nodded his head in empathy and didn't ask anymore questions. The weird grocery store experience healed a part of me that night. The aftermath of that story is that for years, I kept those sugar free products but never fed them to my child. Not to long ago, I did a huge pantry clean-out and finally got rid of them. It was a little bitter sweet though. Somehow, I had grown quite fond of those sugar free things. It was necessary to say good-bye because it helped me move through another stage of acceptance. 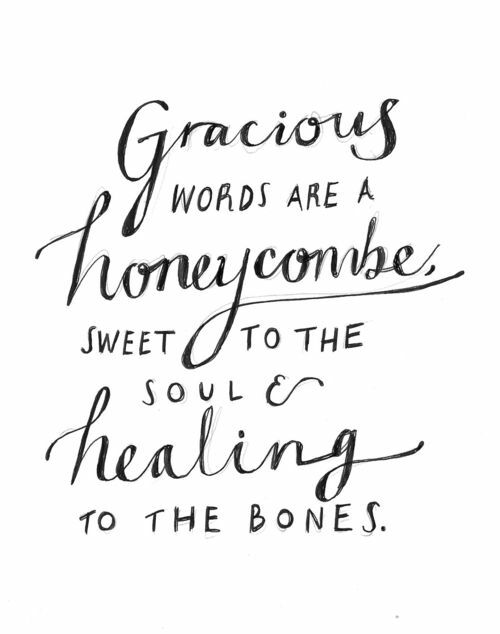 Each time I pass through the land of sugar free, I still have a little heart tug. It will always be a part of me. Diabetes Blog Week - Post # 2: Recently various petitions have been circulating the Diabetes Online Community, so today let's pretend to write our own. Tell us who you would write the petition to – a person, an organization, even an object (animate or inanimate) - get creative!! What are you trying to change and what have you experienced that makes you want this change? We, The Undersigned, agree to stop telling children that they shouldn't cry when you give them a (Circle One) shot/injection/blood draw/finger poke because they are "used to it". We, The Undersigned, (Initial Here) _________ agree that if not immediately providing a cease and desist, the above said children will be allowed to poke us to see our reaction. Sometimes the struggle is understanding how to deal with well meaning, yet inaccurate comments about Type 1 Diabetes. Thinking about this, helps to put them into perspective and allows us to heal. As a mom of two sweet little girls and as a wife of a wonderful husband, when Mother's Day rolls around, I am well cared for. As soon as my daughters grasped the concept of giving mom a special day, they took charge of creating home made cards, picking newly planted annual bouquets and ordering their daddy 'to get the best present for Mama cuz she deserves it'. Thank you to my sweet little girls. Already my kitchen table is decorated with flowers and gifts. Special thank you's to my husband for joyfully going along with their requests and even adding his own surprises - I love you all! For 12 years in a row, complete with my first still in utero, I have been blessed with a loving celebration on Mother's Day. Still, it is not without the famed bitter-sweet. For on Mother's Day, like any other day of our lives, our entire day will be interrupted by type 1 diabetes. There will be site changes and finger pokes. There will be middle-of-the-night blood sugar checks. And that breakfast that us moms love? Well, portions will be measured and carbs will be counted so that insulin can be dosed. Because that is just the way it is on Mother's Day and every other day of the year. This year, on the cusp of our lucky number seven anniversary of type 1 diabetes, having to do all of those things in order to manage type 1 diabetes seems, well, normal. Doesn't every Mama or Mommy, Mom, Mother have to do that for their children? And if that answer is no, than I think they are missing out. Because on this special day, I am going to reflect on the good things of being this kind of type 1 diabetes mother. Like how my children and I have developed a relationship so powerful that we instinctively know what is happening without so much as a spoken word. One look between us is all that is needed. Our bond will never be broken and our trust is complete. Literally, my children have honored me with the privilege of keeping them alive and well, even as they sleep. There is no greater gift than their faith in (me) mom. I treasure it. Even greater than that, I am going to focus on the way that being this kind of mother has both softened and toughened me. Like the old adage 'don't sweat the small stuff and family is everything' to becoming the mama bear and advocating for equal treatment at school, better care options and even voicing my needs on a political level. For my little cubs, I will not back down. I have grown into this role and I know that it has made me a better person. Pretty cool list, isn't it? Erma Bombeck wrote in such an eloquent way of why we were chosen as a type 1 diabetes mom. When I first read her poem, I felt put-off and embarrassed. I didn't feel any different than any other mom. In fact, I felt worse. 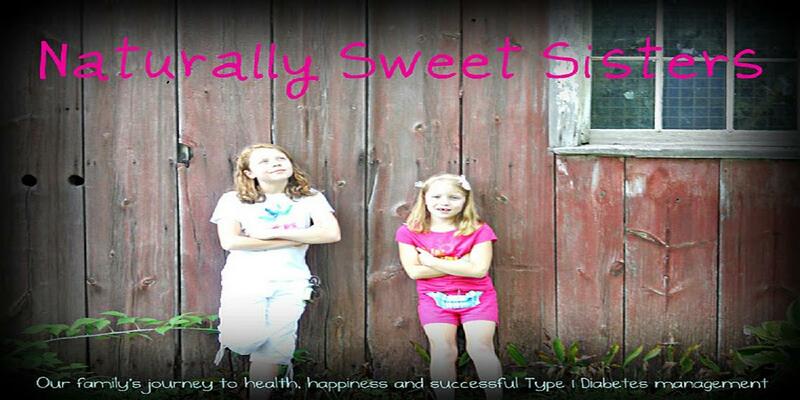 I thought I would never become the kind of mother that could handle type 1 diabetes. 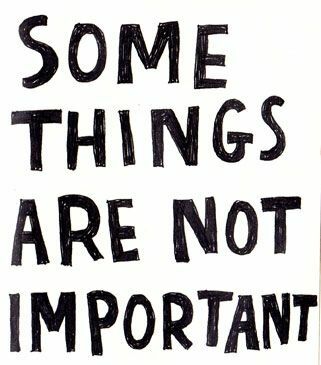 I felt like a phony; someone who just went through the list of type 1 diabetes requirements to get through until the end of the day. And then, somewhere it occurred to me that maybe I was being too hard on myself. My children were happy. They were healthy. What's more, they even liked hanging around with me. We had our own little universe that included silly pranks and inside jokes. I even found myself relaxing and learning how to accept and enjoy our new life. With all of that change occurring, I started to think more and more about the positives of what this disease was bringing into our lives. Maybe your journey with type 1 diabetes is just beginning or maybe you have been doing this for many years, no matter the length of time, I know you have your own list of positives too. Your own personal accomplishments and victories. Think about them and write them down. Maybe you create a list with your family or your write as a part of your personal narrative. Whatever you do, savor your life and enjoy this time - even with type 1 diabetes. Most important of all, realize that you have made a difference in the life of a child. That is the greatest accomplishment of all and today, I honor YOU and all the mother's that are caring for someone with type 1 diabetes. I recently wrote two of our senators in regards to making sure that the NIH continued to receive funding for type 1 diabetes research. From JDRF: The annual funding that NIH receives complements the money provided by the Special Diabetes Program (SDP), which was renewed earlier this year. Both the annual funding at NIH and the SDP are advancing critical research to cure, treat and prevent type 1 diabetes. Congress is beginning to make tough decisions about funding for federal agencies for next fiscal year, including NIH. Please email your Senators TODAY and ask them to sign-on the letter being circulated by Senators Casey (D-PA) and Burr (R-NC) to the Senate Appropriations Committee, asking for strong NIH funding. We need as many Senators on this letter as possible, as Congress is dealing with very difficult spending decisions and limited resources. I urge everyone that would like to see better treatment, research and even a cure for type 1 diabetesto speak out and be heard by our government. 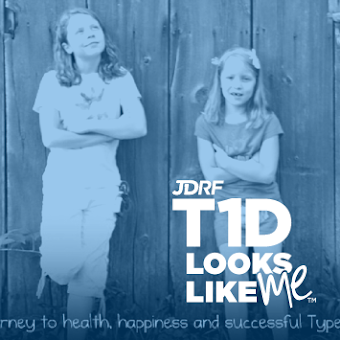 Advocate for your family and for all of the others that live with type 1 diabetes. It takes moment and the reward is great. In case you are interested, below is a copy of my response letter from Senator Carl Levin. Thank you for contacting me about medical research. I appreciate hearing your thoughts on this matter. The National Institutes of Health (NIH) is the primary agency within the U.S. Department of Health and Human Services that conducts and supports biomedical and behavioral research. The NIH consists of 27 institutes and centers and funds 325,000 scientists in 3,000 places across the United States. Among the NIH institutes are the National Cancer Institute (NCI), the oldest and largest institute; the National Heart, Lung, and Blood Institute (NHLBI); the Eunice Kennedy Shriver National Institute of Child and Human Development (NICHD); and the National Center for Advancing Translation Sciences, which is dedicated to turning basic science research into disease cures. Although some research is conducted internally by NIH institutes, nearly 80% of NIH funds are distributed through a competitive grant process to outside researchers. In FY2012, Michigan entities received 1,570 research grants totaling $619 million, making Michigan the eleventh leading recipient of NIH grants. On April 10, 2013, President Obama released his proposed fiscal year (FY) 2014 budget request, which included $31.3 billion for the NIH, an increase of $471 million more than the FY12 funding level. I agree with many of my colleagues that it is important to maintain robust NIH funding. As a result, in April 2013, I joined several Senators in sending a letter to the Chair and Ranking Member of the Senate Committee on Appropriations and Subcommittee on Labor, Health and Human Services, and Education, and Related Agencies, urging them to maintain a strong commitment to funding for the NIH in the Labor-Health and Human Services-Education (LHHSE) bill as they begin work on FY2014 appropriations. Significant medical research also is performed through the Department of Defense's Congressionally Directed Medical Research Programs (CDMRP), which seeks to find cures for cancers and other diseases. The CDMRP was created in 1992 as a breast cancer screening and diagnosis project for U.S. military women and their dependents. After many years of growth, the CDMRP is now second only to the National Cancer Institute as a source of funds for breast cancer research. In addition to its work on breast cancer research, the CDMRP also manages research grants for other diseases, including osteoporosis, neurofibromatosis, tuberous sclerosis, chronic myelogenous leukemia, as well as prostate and ovarian cancer. Medical research must remain a priority, and I will continue to work to ensure that Congress provides ample research funding. Thank you again for sharing your views. With much love and care, this video was produced by JDRF to showcase the need for donations for research and ultimately, a cure for Type 1 Diabetes. It is unscripted and honest. Most of all, it is REAL. Just heard that our total donations from the Promise Ball is estimated to top out at around $800,000 when all of the final monies are tallied. We are so proud and hope you are too! CLICK HERE TO WATCH THE VIDEO or if you are viewing off Facebook/Twitter than cut and paste into a new browser. Thank you. My titles are often kooky, right? I like to think of it as my writing hook. After reading it, my hope is that I can reel you in and then, befriend you for life. It is what I love most of all in this type 1 diabetes world: making friends. Now this hook actually represents what happened during the ball. The cool thing is that only four people will realize that. Seven years later and we have a better handle on blending. Blending in with type 1 diabetes can be tricky. First, there is the gear. How do you store two blood sugar meters, two CGMs named Sigums, one million lancets, strips, candy, glucose and the ever present glucagon? Even worse, what do you when you are wearing a fancy evening gown and trying to discreetly hide an insulin pump and tubing? 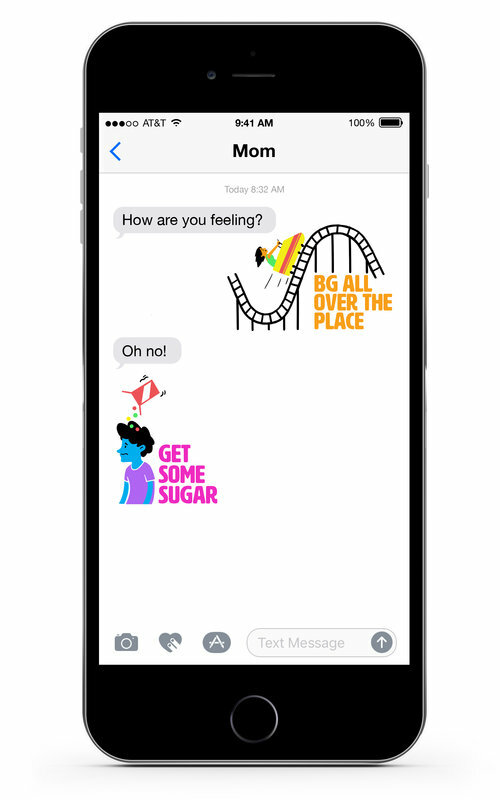 The other mom who is raising a son with type 1 diabetes, sent me the world's cutest text the day before the event. I responded by telling her our plan of attack which included all of us carrying clutch-style bags and utilizing the Naturally Sweet Dad's dress suit. Did you know that men's clothes free up another 8 potential pockets for storage? Yeah baby, it is like taking the Diabetes Supply Closet on the road! Even with that massive safety packing and planning job under our belts, it didn't stop the inevitable from happening. 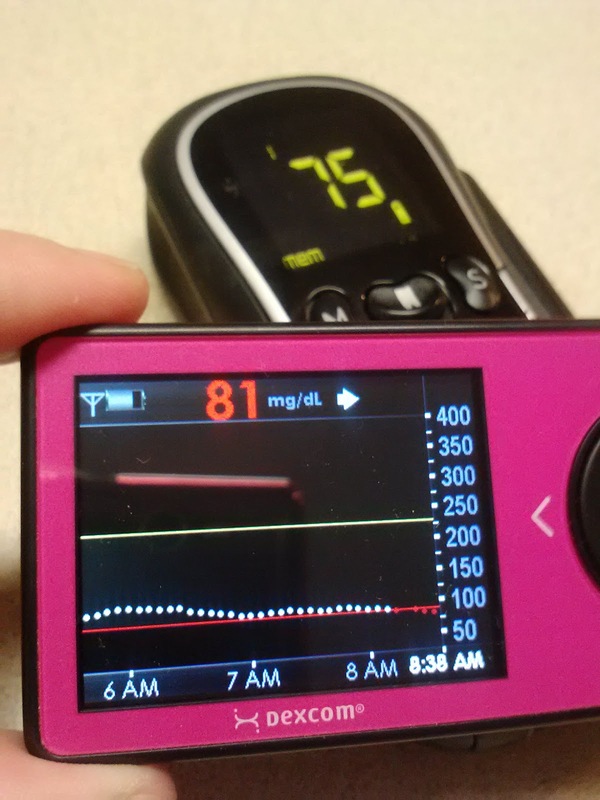 Walking down the hallway from the hotel room, into the hotel elevator, stopping at floor 3 and walking into the reception area, my youngest daughter's blood glucose plummeted about 100 points to a nifty 50 mg/dl. I knew that number because, in order to lift the weight of the diabetes burden off the girls shoulders, I had neatly tucked both pink Sigums into my clutch bag before leaving the hotel room. Peace of mind for me and less mom questioning for them. An old picture of Sigums, not from the evening. I was too busy being MacGyver. Crap. (well, I think I muttered something worse, but someone sounding like a truck driver while wearing an evening gown was stress-relieving). Even more stress-inducing was the fact that the Sigums began slant down arrowing and whining LOW, Under 90. The kids were talking to the adults around them and enjoying the glow of the spotlight. I decided that interrupting that was like throwing a huge diabetes cloud on top. Plus, it wasn't as though it was dangerous, it was just getting to that point, that maybe a few appetizers would be a good idea. Thinking I had a moment, we walked over to the bar to find a pen to sign a card for the lovely Fairy Godmother. While waiting for the pen, Sigums impatient with our reaction, upped the ante by screaming LOW, Under 60 and changing the arrows to two pointing straight down. It happened so quickly, in a mere manner of minutes, that actually no amount of suit pockets or clutches stuffed to the brim seemed appropriate. Smarties, fruit snacks and juice boxes take time. Time that was chipping away at the safety of my child. So here is where the diabetes smarts kick in. At this point, I honestly think I am a bit like MacGyver or maybe one half of the Wonder Twins. Instead of panicking and screaming, which is really the instinct of every single parent that deals with life-threatening situations, I calmly looked around to see what we could do to make it better. Then it hit me. I am standing at the bar and of course - FULL SUGAR COCA-COLA. Even Fries and chicken fingers have a place in this world. A few sips, actually an entire glass later, and my little girl is coming back to me. The color is returning to her cheeks, she starts to focus in on her surroundings and she seems like herself. Checking Sigums and noting the 60 mg/dl is still on the screen, but the arrow is now pointing sideways which tells me the danger is passing. Quietly, without saying anything, we continue on. The girls decide to try the photo booth, not once but multiple times. Then, they beg to go order their own drink which is a diet cola Shirley Temple. The bartender, probably tired of pouring adult drinks, makes a big fuss and sends them off with not one, but with three maraschino cherries for extra pizazz. And just at the right moment. The chef for the event comes over to our table to ask what the little ones would like him to make for dinner. Settling on French fries and chicken fingers, the children are delighted. Thinking back on it, with all of the dancing, it was probably the perfect food to hold blood glucose steady. Yes, those are my girls on stage. Even the band couldn't resist! Magical, I tell you! Later that night as I sit at the dinner table and try to absorb the moment we are in, taking in the details of the musicians, the sound of the music and most notably, the way my girls are dancing so carefree, I decide that one other thing that I must thank is the invention of sugary soda. She danced with everyone. And even by herself. Maybe it was the shoes with the little flowers on the toes? And danced, and danced, and danced. 'Till she could dance no more. And also, thank you to bartenders that adore little girls that know how to ask for a Shirley Temple.